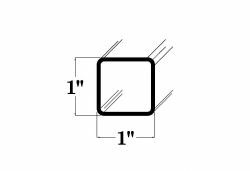 1" with a .065" wall Square Tube and 1/16" R corners. Available in satin and black anodized finish in 24 ft., 12 ft., 8 ft., 6 ft. and 4 ft. lengths. See above document link to display all square and rectangular tubes in a Table View. We also stock nylon corner connectors in black and grey. 1" Square Aluminum Tube w/.065" wall and 1/16" radius corners for connectors.